From the time when winning on the track trickled down to the best hardware on the street, comes these strong and lightweight OEM factory Control Arms. 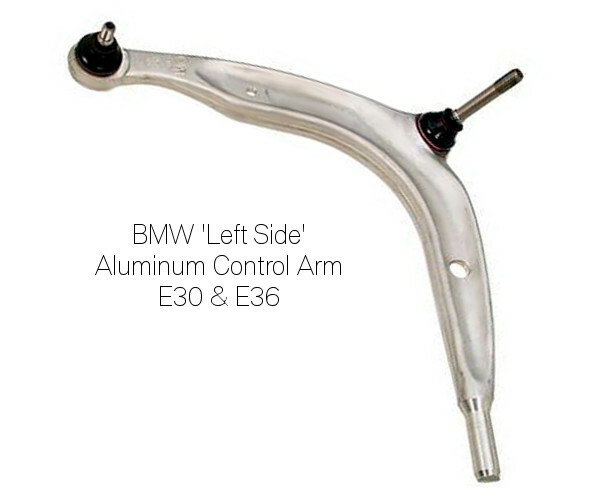 BMW OEM E30 M3 aluminum control arms are the ideal upgrade or replacement when replacing your current control arms. Fitted to the M3 when its #1 job was to win races, these arms function identically to their steel counterparts and are a popular upgrade for all E30s, E36s, Z3, and M Coupe or roadster. Reduces un-sprung weight for improving handling, feedback, and braking. Very high strength forged aluminum construction. Reduces unsprung weight, helps suspension response, and improves steering feel. -Some indications you might need control arms if you have already performed a correct alignment: wandering at speed, darting wheel over uneven pavement, uneven front tire wear, and/or clunking noises. If you have not yet done so while owning your BMW, we recomend replacing your front control arm bushings for improved front end feel, an ideal time is when replacing your control arms. -It is recommended by the BMW CCA Racing that all tracked cars should replace their control arms every 2 years. The cost of all BMW ///M parts continues to rise, don't wait to get your control arms!